The kind folks over at The Vegan Heritage Press sent me a copy of Zsu Dever’s cookbook, Everyday Vegan Eats, and I’m glad they did! This was a fantastic opportunity to learn about Zsu’s cooking style, which is comfort food made vegan. Zsu has a unique ability to fuse together completely accessible ingredients with easy and approachable techniques to create well-balanced flavors and textures that anyone can create and enjoy. Packed with a ton of homestyle favorites like baked macaroni and cheese, vegan meatloaf with herbed gravy and mushroom stroganoff, Zsu’s recipes are perfect for the new vegan who is seeking out ways to enjoy classic comfort food but not exactly sure where to start. In addition to her fantastic recipes, Zsu also includes helpful tips on how to plan menus, stock a vegan pantry and where the shop to maximize your dollar and get the most out of your grocery shopping trips. For the seasoned vegan, this book is a great reminder that classic homestyle vegan food is not only accessible and approachable, but also fun and easy. After flipping through Zsu’s book, I first made her chicken-free salad sandwiches, which utilize tofu, tvp or soy curls as the protein base. I chose soy curls and seasoned them with Zsu’s savory broth mix (recipe can be found on page 19), which infused them with an amazing depth of flavor that complemented the other salad components perfectly. I loved every bite of this dish, so I’m excited that Vegan Heritage Press has not only kindly agreed to allow me to share the recipe here but is also offering a free copy of Everyday Vegan Eats through this post! To enter, just leave a comment below that includes your favorite vegan comfort food dish, and please include your email address or some way to contact you if your comment is drawn as the winner. Shipping for this giveaway is limited to the US only. I’ll randomly choose a winner on July 25. Good luck! Congratulations to bitt, winner of this giveaway. Thanks to everyone who entered! From Everyday Vegan Eats: Family Favorites from My Kitchen to Yours by Zsu Dever. Copyright ©2014 by Zsu Dever. Used with permission from Vegan Heritage Press. 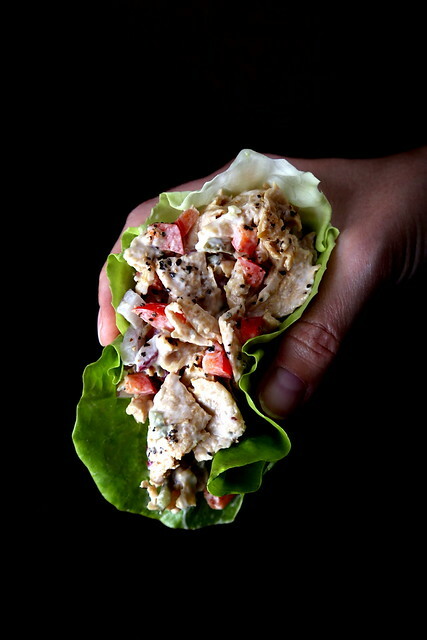 Your protein of choice – Soy Curls, tofu, or TVP – is right at home in this easy-to-make sandwich filling. You can take a step back in time to the eighties and stuff it into a tomato or just add it to a bed of crisp green salad. 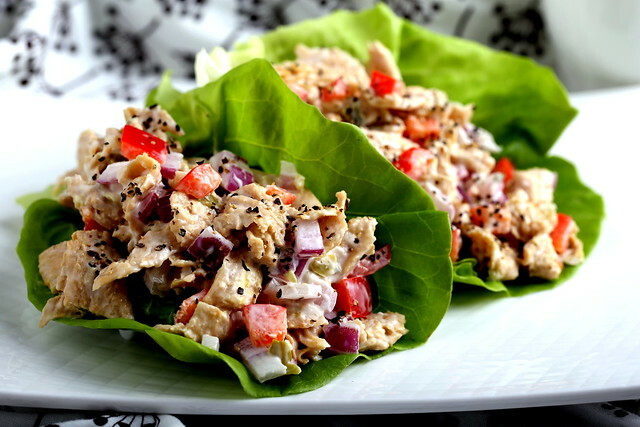 Of course, it’s also fantastic between two slices of bread or served in lettuce cups. In a large bowl, combine your protein of choice with the celery, onion, bell pepper, mayonnaise, relish, and salt, and pepper to taste. Set aside for 10 minutes to blend the flavors. 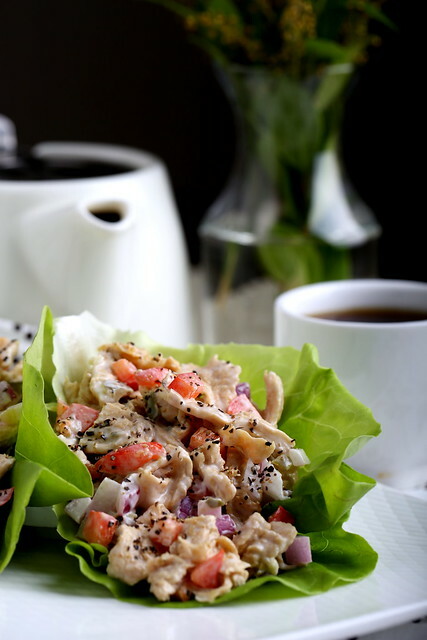 Make sandwiches with the mixture, using either toasted bread or lettuce cups. I love the recipe and I'd love the book don't live in the US – I wish you could enter, if you agreed to pay the postage – we don't get vegan cookbooks over here! my favorite vegan comfort food is definitely mac + cheeze! I love it with kale, peas, or mustard greens added and lots of nutritional yeast! Ultimate favorite is vegan Chicago style deep dish pizza! I also love lazy anya – my lazy lasagna inspired casserole. Tofu sandwiches with savory sauce and all the fixings on sourdough. Anything with avocado- add tomatoes & I'm in heaven! I'm brand new to vegan, have been a vegetarian for awhile. I supposed anything with tofu is a favorite. I like a vegan Pad Thai. MY favorite vegan dish is definitely Pad Thai with edamame, broccoli, cilantro and peanuts with crushed red pepper flakes!! I would eat that daily if I could! Love your site!! I love the cashew cheese recipe. Thank you for inspiring me with so many wonderful ideas. Yes, please! I have been vegetarian for 20 years and have been toying with the idea of veganism. My comfort foods are anything creamy and anything Thai. I would love a whole book devoted to vegan comfort foods. YUM!! I love vegan Pad Thai. I like Veronica's additions so I'm going to have to make a few improvements to mine! Thanks!! I would love this book, to celebrate my 30th vegan anniversary. My favorite vegan comfort food is mac and cheese. That recipe looks amazing. I can't wait to try this book! my favorite recipe is vegan man n cheese (made with sweet potatoes) topped with portobello mushrooms. i make a big batch, and my husband and i take it to work for lunch! i am always looking for new recipes, and i love your blog. keep up the great work! My favorite comfort food is any kind of pasta! Thanks for the chance, I'd love to have this. Rice/quinoa pasta with cashew cheese, nutritional yeast, salt, olive oil OR pasta with just cashew cheese and dill. Those are my go-to summer favorites for comfort food. Oh, and I'm loving toasted quinoa patties, cut into fingers and dipped in ketchup (they taste like onion rings to me). Thank you for asking! It's so simple and boring, but buttery rice/quinoa/noodles, sprinkled with nooch, is my go-to comfort food. Vegan mac 'n cheese, or vegan bacon cheese burgers! Sloppy joes and chili mac, either made with tvp, soy crumbles or lentils, are my favorite vegan comfort foods. Yum! Vegan pizza – preferably grilled. Even in winter! I love your site. Keep up the good work! Black bean soup with soy chorizo and kale. My favorite comfort food is a cashew based Alfredo sauce over whole wheat noodles with whatever veggies I have tossed in . Vegan Mac & Cheese FTW! Vegan Mac n Cheeze is my comfort go-to also! My comfort go-to is cashew creamed greens: kale, brussels sprouts, broccoli, you name it. Hope this does not count against me, the 1st day I could not find a place to comment, so emailed you! My favorite recipe is for Quinoa Pizza Bites – y'all can find it on Deliciously Dairy Free's face book page. Or just post a request there and one of the admins will help you find the blog! My email is: teribeariblue@yahoo.com Thank you! 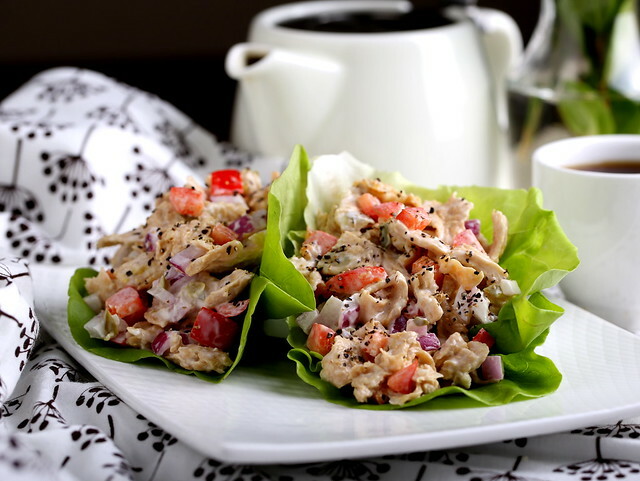 My favorite comfort food are marinated mushroom wraps, from Penni Shelton's "Raw Food Cleanse". I change it every time, but it's essentially sliced mushrooms, onion, garlic and liquid aminos left to marinate for an hour or so, and then served in stemmed raw collard greens with julienne carrots and cucumbers, and a generous amount of avocado. They are soooo good. My favorite comfort food is definitely any kind of creamy vegan pasta. When I want something I made a lovely vegan Puttanesca Sauce from scratch with lots of kalamata olives, capers, crushed red pepper, and red wine. Over any kind of pasta is great. Sounds lovely but I wonder how many of the recipes involve wheat? Most of our family is gluten free and it's made it so tricky to find cookbooks that work for us. I have to adapt all of the GF cookbooks to be vegetarian, and I have to adapt all of the vegan cookbooks to be GF. In any case, it sounds wonderful. Since I am just starting to try vegan foods, I don't really have a "go to" comfort food yet, but I really look forward to trying Zsu's mac and cheese . . . and lots of others. Thanks for the opportunity! My favorite vegan comfort food is…sadly…French fries. 🙁 So unhealthy, I know! Butternut squash sautéed with shallots and sage served over spiced black lentils. I'll join the chorus of praise for nooch Mac n' Cheese 🙂 My go to is a big bowl of pasta with spicy tomato sauce and whatever veggies I have in my fridge. Biscuits and gravy! My husband and I are both from the South and even though he's an omni he loves it on a cold Sunday too. i wish i could say otherwise, but mashed potatoes whipped with salt and tons of westsoy milk are my very favorite treat. thank you for the giveaway!